Marlink has provided more than half a gigabit per second of throughput on their global Sealink VSAT network for MSC Cruises’ new Seaside class cruise ship, at the service launch ceremony in Monfalcone, Italy on November 30, 2017. MSC Seaside will officially be named at a naming ceremony in Miami, Florida, USA, on December 21, 2017, where Marlink is scheduled to provide similar throughputs that will also apply for its maiden voyage. 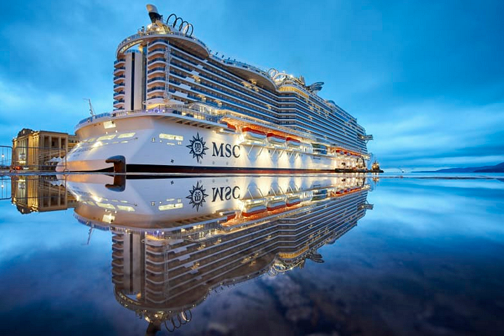 MSC Seaside is the 14th addition to the Swiss-based Company’s state-of-the-art fleet and the second new MSC Cruises ship to come into service this year, the first being MSC Meraviglia, which enjoyed a then record-breaking 300 Mbps service for its maiden voyage in July. Marlink provides connectivity for MSC Cruises’ entire fleet in an optimized, dedicated ‘cloud of bandwidth’, providing the highest availability and redundancy available today on its continuously expanding Sealink network made up of 25 satellites and 32 overlapping beams. MSC Seaside in Trieste. Image is courtesy of MSC and Mike Louagie. From its home port of Miami, MSC Seaside will deliver luxurious Caribbean itineraries all year round. Guests can expect a truly connected cruise experience on board, through the ‘MSC for Me’ digital innovation program that uses the latest cutting-edge technology to connect holidaymakers seamlessly with the experiences that matter to them, whether at sea or on land. Marlink’s VSAT services are a key enabler, ensuring that guests enjoy fast and reliable access to Social Media platforms where they can share their experiences with friends and family at home. The record-breaking throughput for MSC Seaside will be enabled by Marlink on Intelsat’s new EpicNG High Throughput Satellites, which provides extensive coverage throughout the planned sailing area, in combination with the latest modem technology. The temporary throughput will meet extra demand from media and guests to connect to the Internet on board as MSC Cruises’ newest and innovative cruise ship heads to the Caribbean for the first time. On completion of the maiden voyage, MSC Seaside will continue to experience market leading high throughput on the Sealink network, ensuring widely available connectivity for all guests. Tore Morten Olsen, President Maritime, Marlink, reported that working closely with partners the company achieved milestone throughput earlier this year for the MSC Meraviglia maiden voyage, but reflecting the potential in Marlink's Sealink VSAT services, the company has been able to almost double the previous record for the introduction of MSC Seaside. While these record breaking figures show what is possible with cutting-edge satellite technology, it’s important to remember that the Marlink network continuously delivers the highest throughput services for cruise ships on a daily basis. The cruise industry will soon expect throughput in gigabits and not megabits which is why the company is pushing the borders of what the current technology can offer cruise customers.